In the time before magic was forgotten and the world was split in two, the fairies ruled all that was dry and the mermaids ruled all that was blue. There was only one Unbreakable Law… the two worlds may never collide. Lilliana was a flower nymph and spent her days in the fields sculpting new blooms. Her blooms were so exquisite that the sight of them would take your breath away! Scatterings of pinks and hues of peach, her flowers where legendary! Fairies would come from all over the Kingdom to see them. This pattern or any portion thereof may not be reproduced or disseminated in any manner whatsoever, without the express written permission of the designers and authors. You may sell what you personally make – provided it is hand made by you and not commercial in quantity or production. For questions relating to permission or usage please contact us. Atlanticus was designed using double knit cotton. Intermediate – Don’t be put off by the skill rating, this pattern has a comprehensive photo tutorial included with great support in our fb group and many novice crocheters have managed to complete this pattern. This is a digital PDF pattern that can be downloaded immediately after purchase and will also be available in your pattern library. If you purchase on Ravelry you can login to your Ravelry Library to access the pattern, if you purchase on Hooked on Sunshine you can login under my Account and access your patterns in your Library. The Compendium contains new reworked Hi Resolution photos, The story, the Alternative start, A brand new colourway and you will get a bonus addition (in January) of the EXCLUSIVE Arcelia Square pattern as well as the print friendly pattern. 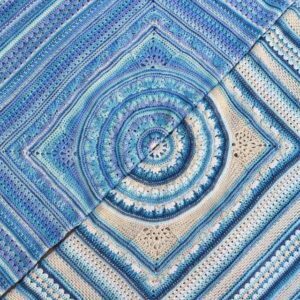 Even if you have done Atlanticus already, you’re going to love the reworked photo tutorial and bonus Square. * This compendium is available in English only. These are the older files from the original Crochet Along – if you would prefer better quality images, the new colourways, alternative start and the bonus square – then consider rather purchasing the Atlanticus Compendium. Language files were kindly provided by the CAL group. All pattern support in Hooked on Sunshine is however provided in English. Gorgeous hand dyed and air dried South African Cotton Yarn kits. 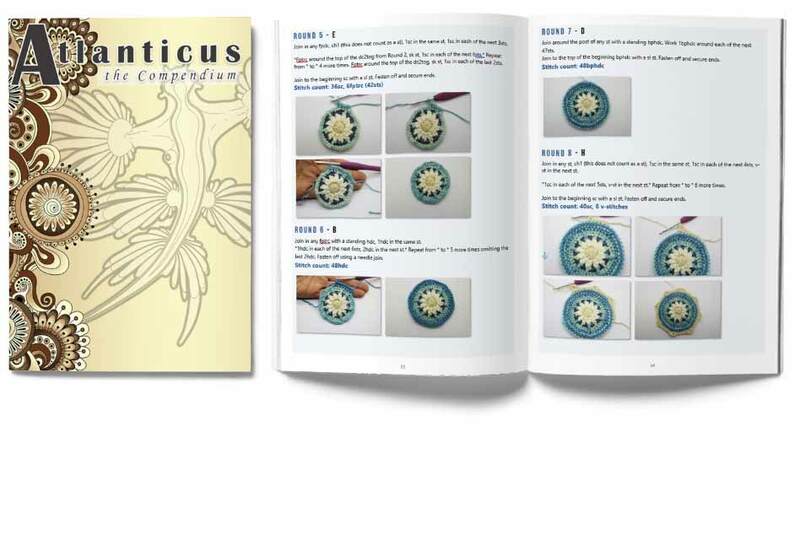 The Compendium is included as free with any Atlanticus yarn kit purchase which you can access under My Account – Special Downloads. We have improved our shipping system because know we have disappointed and frustrated folks when you have waited weeks for the yarn to be dyed and then weeks for it to arrive by airmail. To improve our system we have reduced our leads times from manufacture to having now added DHL express as an option- delivered faster and with full tracking. Please note many of our products are still made to order and there are still leads times when crafting hand made yarn. Also if you have ordered a KIT for a CAL or pre-release – please check the date kits are due to ship from. To use this option – select Worldwide express (the option may not be available on all items or to all locations). and counting! – Total Unique Downloads for our Patterns on Ravelry and HOS.